Right from the beginning of Ocean’s Eleven you know you’re in for a treat! The stunning opening credit sequence designed by master stylist Saul Bass (Psycho), the supremely cool Nelson Riddle score and one legendary star’s name after another all signal a picture that just can’t fail. This legendary heist caper featuring the immortal Las Vegas “Rat Pack” (Frank Sinatra, Dean Martin, Peter Lawford, Sammy Davis Jr. and Joey Bishop) is probably my favourite caper picture ever. 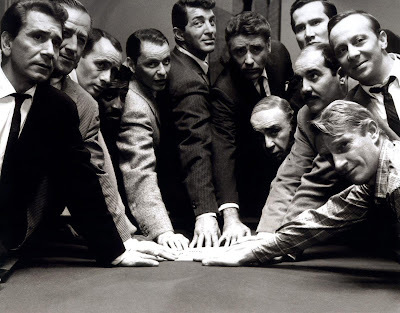 It’s not the best heist picture ever made – that honour would go to Jules Dassin’s Rififi – but Ocean’s Eleven is the coolest. Remade in 2001 by Steven Soderbergh (and followed by two sequels), one could even argue that the more recent picture is technically better made. I’d not argue that at all, but in spite of this, Soderbergh’s George Clooney-Brad Pitt, et al extravaganza of contemporary star power has nothing memorable about it – nothing at all. You watch it and once it’s over, it passes through your system like so much junk food waste matter. Lewis Milestone’s original rendering, as wonky, occasionally clunky and definitely dated as it is sticks to your memory banks, not unlike a good wad of honey mixed with walnuts, buckwheat and poppy seeds flung to the ceiling by mad Ukrainians during their Eastern Rite Christmas celebrations. Bits of the glop may drop off from time to time, but unless you chisel away at it like some obsessive unskilled labourer at a construction site, those delectable globs are there forever. And that’s pretty much what the 1960 Ocean’s Eleven is – a delectable glop of honey mixed with walnuts, buckwheat and poppy seeds! It's sweet, tasty and sticks to your insides. Detailing the adventures of some aimless old army buddies in post-war America, the picture takes us right into their seemingly insane plan to pull off the biggest heist imaginable – hitting five Las Vegas casinos (The Flamingo, The Sands, The Desert Inn, The Riviera, The Sahara) all at once on New Year’s Eve. Not only does it take a first rate crew, but a good stake and tons of planning. Most of all, the operations require the same precision used in battleground manoeuvres. This, of course, is where high-roller Danny Ocean (Sinatra) comes in. During wartime, Danny was a crack squad leader of an Airborne Division. He fearlessly led his boys into the fray many times and always got them through unharmed. He’s a genius at military manoeuvres and always on the lookout for the welfare of his buddies. And now Danny wants them to make up for lost time. Post-war America has ignored them and it's time for some payback. As Danny declares, “Why waste all those cute little tricks the army taught us just because it’s a little peaceful now?” Given that his plan is to rip the casinos off as if they were in battle with the Germans and that he’ll be fearlessly leading the way is enough for lowlife moneyman Spyros Acebos (Akim Tamiroff munching scenery with the voracity of several off-the-wagon members of Weight Watchers let loose in a buffet) to stake them. The fun of the movie is, of course, the WORLD of the movie and not necessarily the heist itself. This is the mistake Soderbergh made with his remake. He trotted out all his stars and proficiently laid out the groundwork and execution of a suspenseful heist. Not that this was necessarily a bad thing to do. The picture worked very well on that level and certainly grossed oodles of money (including the two lousy through-the-roof sequels). What the remake didn’t do (and perhaps couldn’t achieve, due to the fact that Vegas NOW is NOT the Vegas it once was) is create compelling enough backdrops for the movie to be more than an ephemeral hit. When Soderbergh’s picture is long forgotten, I do believe Milestone’s will survive. For example, the first time we see George Clooney’s Danny in the Soderbergh film, he’s in the hoosegow and frankly it’s just not as much fun to see your hero in prison garb as the first time we see our hero in Milestone’s picture. Our first taste of Sinatra as Danny is utterly, irrepressibly, unbelievably, jaw-droppingly cool – or, like I noted before, cooler than cool. In a swank pad, we’re introduced to Danny and his pal Jimmy Foster (Peter Lawford) getting massages from a couple of bodacious beauties. I’m taking Sinatra, Lawford and two blondes over George Clooney in prison duds anytime – hands down! To quote Cagney in Strawberry Blonde, “That’s just the kind of hairpin I am.” Great line, by the way. That’s the other thing Soderbergh’s remake doesn’t have. Can anyone remember a single line of memorable dialogue from the 2001 Ocean’s Eleven? If you can, you’re lying. Or worse, you don't know what a great line is. The other thing Soderbergh’s film doesn’t have is the resonance of the historical cusp Milestone’s version is set on. Situated at the tail end of the post-war ennui AND baby boom and just before the turbulence of the post-JFK assassination, Ocean’s Eleven resonates with the times in ways filmmakers could only dream about in the pre-9/11 world. Even post-9/11, the Soderbergh sequels don't bother with any political contexts. The biggest differences, though, are storytelling elements of an earlier age seldom being exploited in contemporary cinema – especially sentiment. When Henry Silva as one of the team-assemblers comes to visit the sad-sack Richard Conte, he’s faced with a divorced dad, just out of stir, who needs to come up with a whack of dough to keep his son in a swanky private military school. It’s about the only “face” he’s got left with his kid. While Conte's character would prefer to walk the straight and narrow, he asks Silva if his cut of the heist will be enough to keep his kid in school. Silva replies that the cut will be enough for Conte to BUY his son a school. With this particular subplot, there are two sequences so sentimental, yet deeply and almost profoundly moving that Soderbergh, for all HIS contemporary cooler-than-cool styling, would never be able to achieve. Milestone very sensitively directs a visit between father and son at school that continues to move me to tears every time I see it. Sometimes I start bawling like some old grandmother when I simply THINK about the scene. The major tear-squirter occurs when Conte visits his doctor and senses the worst. He asks, “Tell it to me straight, Doc – is it the Big Casino?” And indeed, it is. Conte has very little time to live, as he’s afflicted with lung cancer. He knows well what he needs to do. The fates of all these war veterans have far more resonance than any of the characters in Soderbergh’s remake. The great Sammy Davis Jr. plays a former minor league baseball player who has lost an eye and is now working as a garbage collector. When he’s told how brave he must have been in wartime, he responds with melancholy: “The real brave ones don’t come home.” This is followed by an amazing sequence where Sammy sings the title track of the movie – jamming and jiving to pick up the spirits of his fellow African-American colleagues sitting amidst the garbage trucks in a loading dock. It’s not only an opportunity to get one of the great entertainers of the 20th century to do his stuff on film, but render it in a manner that is credible and rooted in the narrative. The movie addresses the issue of race during this time head-on, and it’s Sammy who gets a crack that must have had audiences of all colours reacting with knee-slapping laughter, but with even more resonance amongst African-Americans. At one point, the Rat Pack is smearing their faces with black shoe polish and Sammy refers to his natural ability to blend in when the power in the casino goes out. He has this great quip: “I knew this colour would come in handy someday.” An interesting side note to this is how Sammy was forced to stay in "Coloured-Only" hotels even though he was playing at swanky joints in Vegas at the time. During the shooting of the film, Sinatra himself put an end to this racism during the film's shooting. Segregation in Vegas came to an end because of this. Sinatra wasn't called "The Chairman of the Board" for nothing. Who can write great dialogue like this these days? I can count them on one hand. What actors can even render this dialogue today or, for that matter, even ad-lib it? Of all the Rat Pack movies, Ocean’s Eleven is clearly the best. Sergeants 3, directed by John Sturges, was an okay semi-remake of Gunga Din, 4 for Texas was a moderately enjoyable western comedy directed by Robert Aldrich and Robin and the Seven Hoods was a relatively cool musical comedy in which Vegas stood in for Sherwood Forest and was directed by prime-cut old studio camera jockey Gordon Douglas. I think Ocean’s Eleven works the best not only because it was the first, but the manner in which it was made was infused with the pure adrenalin of Vegas. All of the Rat-Packers were booked at the same time and playing shows at night, then partying all night and finally, shooting the movie all morning and early afternoon. These guys were primed and they were lucky to have a great old hand like Lewis (All Quiet On The Western Front) Milestone helming the proceedings. Seeing the movie in the real Las Vegas in 1960 with marquees touting the names of Harry James, Red Skelton, Danny Thomas, Louis Prima, Buddy Hackett and others must surely have been a charge while making the movie. Amazingly, it all spews out on celluloid. I mean, My God! We even get a phenomenal scene with Dean Martin singing the great tune “Ain’t That a Kick in the Head” with Red Norvo on vibes. Even cooler is the ending. It’s not only a great surprise ending but is frankly, a shocker. As much as the film is entertainment, it’s so rooted in a reality beyond time and place, it’s rooted firmly in the world of Las Vegas – a world where the house ALWAYS wins! Ocean’s Eleven is a movie that’s as much a part of “old” Hollywood while signalling the eventual “new” Hollywood of the next decade. The movie was clearly more than an ephemeral box office hit. It had influence and staying power. People often forget that this is what can make good movies great. I’m more than happy to extol the greatness of Ocean's Eleven! Ocean’s Eleven is available in a terrific Blu-ray transfer through Warner Home Entertainment that preserves the grain while reflecting the picture’s outstanding colour palette. The extra features include a great commentary from Frank Sinatra Jr. (and occasional patter from Angie Dickinson) and the added treats of a Tonight Show clip with Frank (guest hosting no less) and Angie (as his guest) and some decent little featurettes on the great Vegas hotels.